The STEM X Academy was a once in a lifetime learning experience. In late 2017, I received a wonderful surprise – receiving word that I was one of just 70 Australian teachers selected from 390 applicants to attend the 2018 STEM X Academy in Canberra. 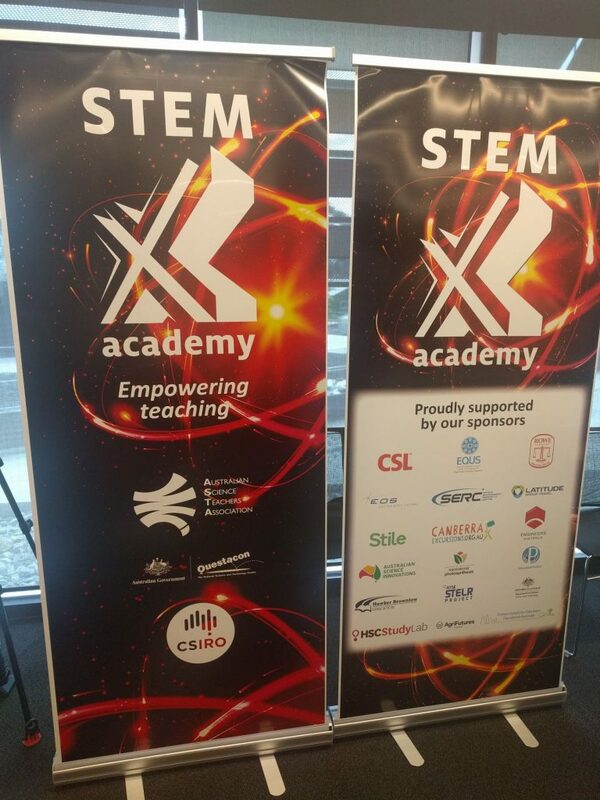 The STEM X Academy is a five-day residential teacher professional learning program run by the Australian Science Teachers Association (ASTA), in partnership with Questacon and CSIRO. 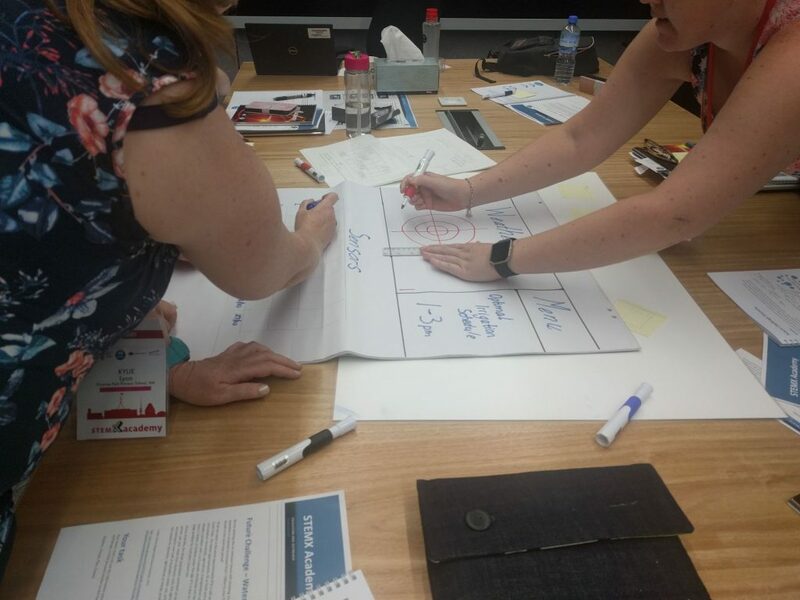 Its appeal lies in its unique emphasis on empowering participant teachers by teaching them how to design, develop and implement their own STEM-based teaching resources, rather than presenting them with a pre-made package of activities (http://asta.edu.au/programs/stemx). In preparing my application, I reflected on the professional hurdles I faced last year, and particularly my approach to integrating Science, Technology, Engineering, and Maths (STEM). 2017 was an experimental, learning year, but I felt like something was missing. I was the STEM Coordinator in a girls’ school, yet I wasn’t confident in my understanding of what STEM is, and how to teach it effectively. 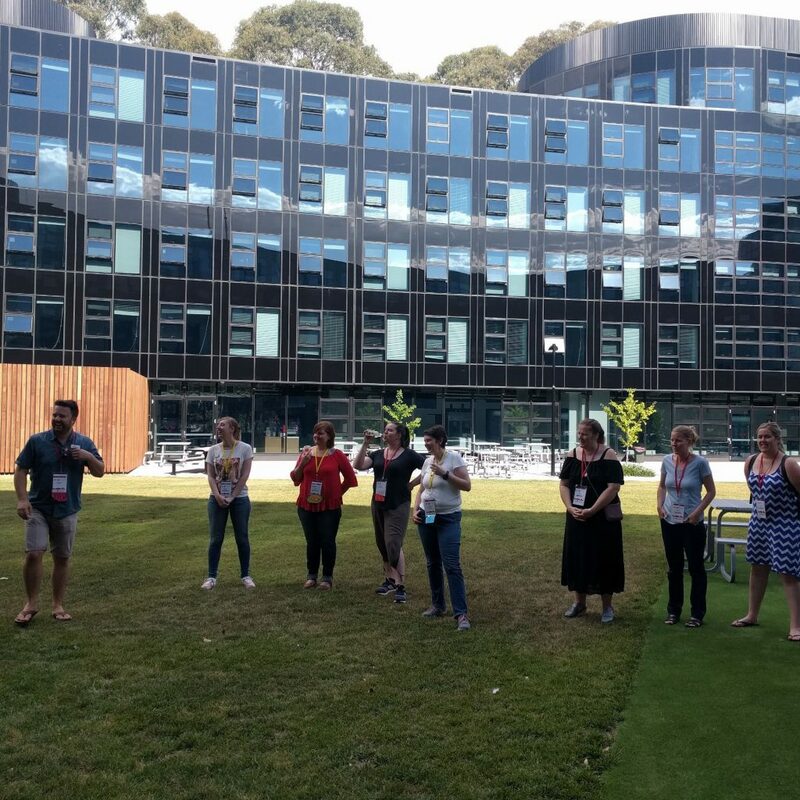 Upon our arrival, we settled into our (terribly overheated, non air-conditioned) accommodations at Bruce Hall at Australian National University, and participated in some icebreaker games. We were up bright and early for breakfast on Day 1. Most of us hadn’t had much sleep due to the lack of air conditioning in our rooms, and jetlag wasn’t helping much either. Lack of sleep would become normal over the course of the week! 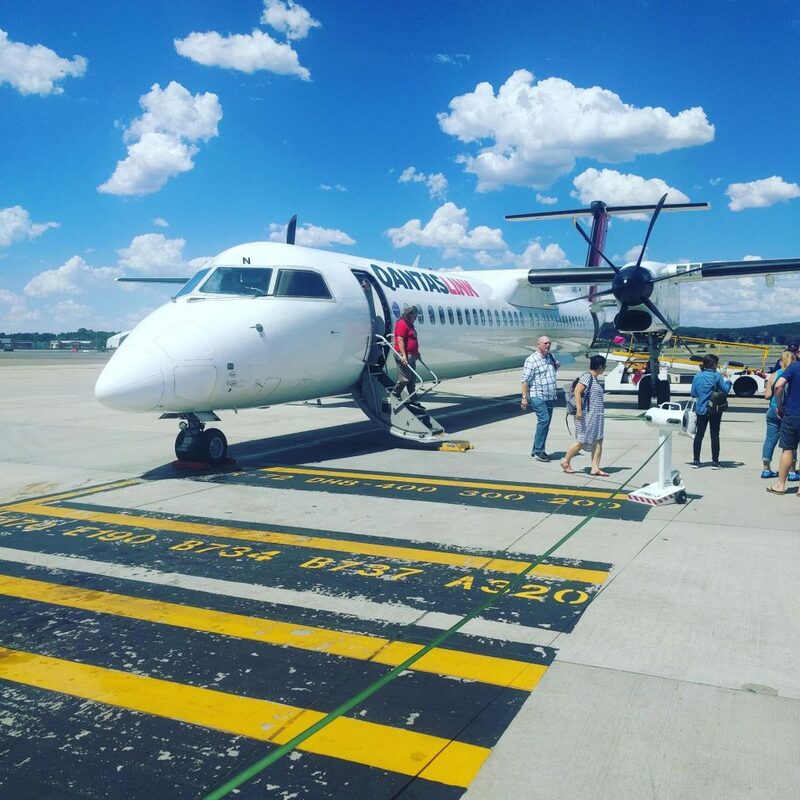 As primary teachers, we spent our first day at the CSIRO Black Mountain Laboratories, where we worked with the excellent CSIRO Education Team to explore and participate in an inquiry-based approach to teaching STEM. We started the day exploring the Global Megatrends identified in the Australia 2030 Report, which attempts to outline the global challenges and future scenarios we may face in the coming decades. These megatrends can provide a framework for student inquiry and investigation into real-world problems. We also had a brief insight into the current research areas at the CSIRO. 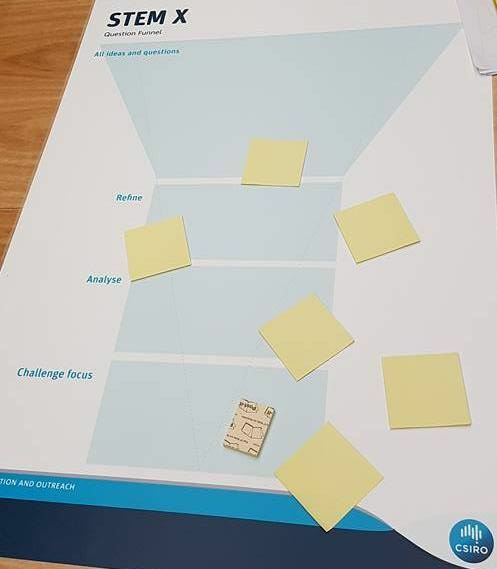 Our first major CSIRO learning task saw us split into teams, with each team assigned a global megatrend to explore and design a solution for. 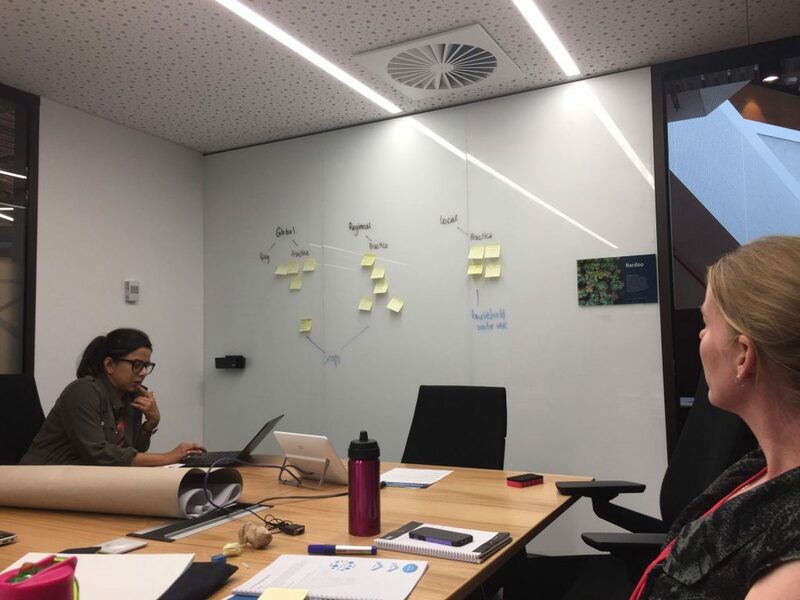 Our team worked with CSIRO Education expert Emily, and Dr Ashmita, a CSIRO Senior Research Scientist specializing in ecohydrology. In my understanding, her research focusses on the relationship between land use and the health/management of water systems. Using an open inquiry process, we brainstormed questions and potential areas for our inquiry, choosing to categorizing them under global, regional, and local contexts. We were challenged to narrow down our inquiry to one quality question we could research and take action on. This was a harder and more complicated process than I had realised. After extensive discussion, we decided to focus on the use of robotics and digital technologies for improving irrigation efficiency in agricultural crop production. 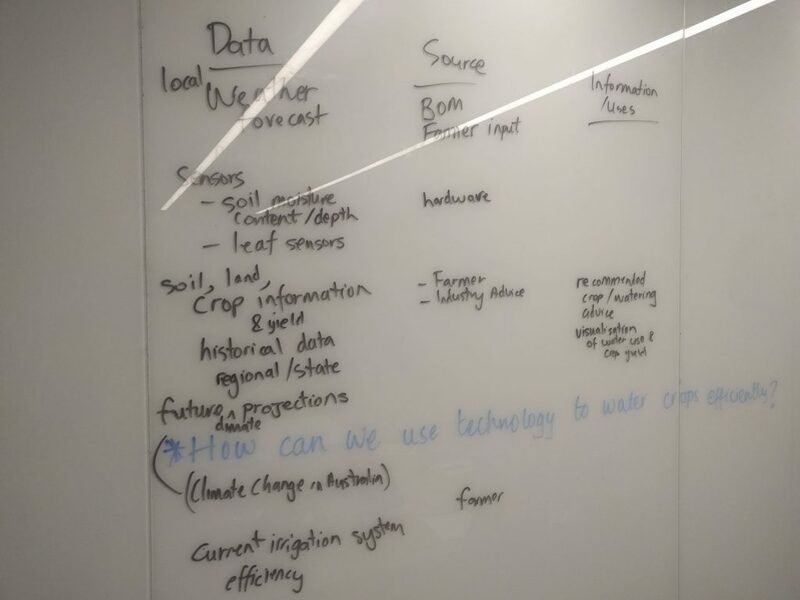 We ultimately prototyped a mobile phone app, which would use data from ground moisture sensors and weather data to help farmers improve the efficiency of their crop irrigation practices. The sensors and weather information already exist, but we wanted to try and present the data they provide in a more practical and useful way on a mobile device. After several frantic hours of intense collaboration, we pitched our idea and mobile app prototype to the rest of our primary group. We ended the day with a visit to the CSIRO Discovery Centre, followed by a dinner back at the Australian National University. 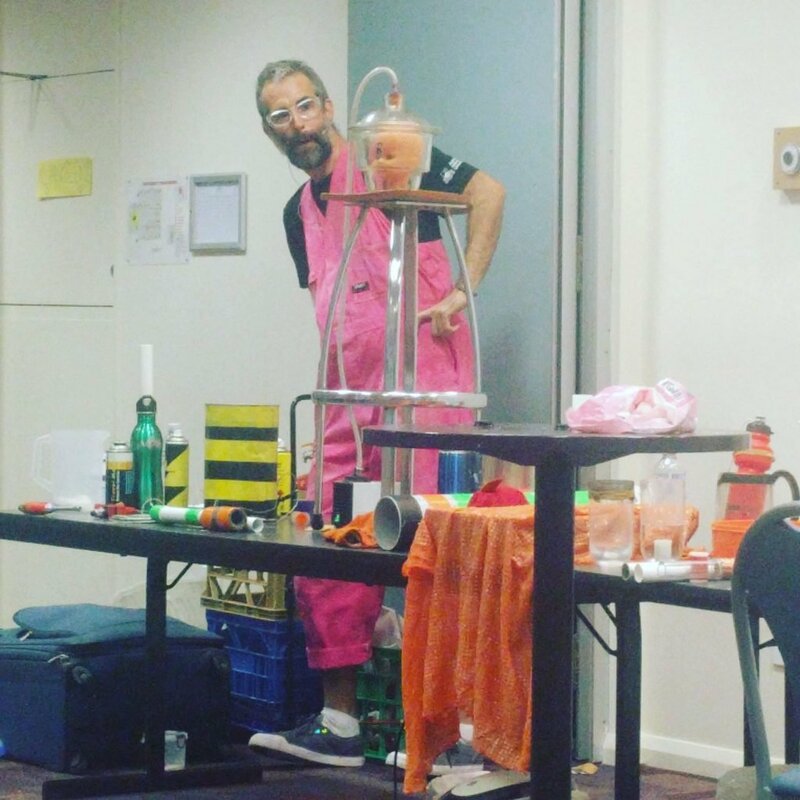 The highlight of the evening was a science show by Dr Graeme Walker, featuring vacuum cleaner bazookas, putting a doll’s head in a vacuum chamber, and blowing teddy bears sky high using compressed (and explosively released) liquid nitrogen! We were exhausted, but it was quite a show! Several years ago, I started my exploration of Scratch coding with a group of highly motivated students who were happy to dive in, figure out how it worked, and answer my questions – which typically started with “How on earth did you do …?” We went on a learning journey together, and considering that I didn’t really know what I was doing, it is quite surprising how far we managed to travel. Fast forward to 2017, the first year that we had to assess and formally report on our students’ understanding of, and application of visual programming. I spent my Christmas holidays teaching myself Scratch, drawing upon tutorials published by MakeBlock, and any resources I could find on the Internet. I delved into event blocks, loops, IF/THEN branching, and tried to work out which Scratch skills should be taught at each year level. I was fairly sure I understood the content; and based on my experiences teaching Scratch in our after-school/lunchtime clubs, I thought I knew how to teach it. The assessment was still a grey area, but that wasn’t going to stop me diving in and attempting to teach Scratch coding to all students from Years 4-6 for the first time. As part of my new STEM and robotics teaching role, I have been teaching a Scratch game design course in Year 6. Term 1 proved to be rather challenging. The sheer scope of students’ skills and past exposure to Scratch, ranging from absolute beginner to extremely advanced, were hard to differentiate for. In addition, this was the first time many of these students experienced my approach to teaching Scratch, which relied heavily on the use of online learning videos and tutorials shared via YouTube and Google Classroom. While some students produced some extraordinary games like the one above, there was signficant room for improvement. 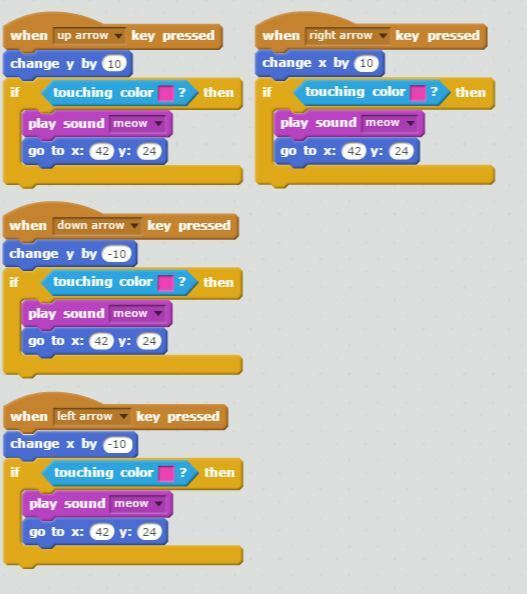 For the Term 2 unit, I decided to explicitly teach and demonstrate some Scratch skills, running 5-10 minute mini lessons and demonstrations of the use of event blocks, loops, and IF/THEN branching. Students then had opportunities to delve further, using differentiated Scratch tutorial cards to learn more about Scratch. During one of these sessions, a question started to arise. When designing a maze game, students need to work out how to control their character sprite movements using the WASD and/or arrow keys. I was pointing the girls in the general direction of using IF/THEN branching blocks (aka conditionals) for their arrow key controls, but we kept encountering problems … Firstly, the IF/THEN block ran once when triggered by an event block; and secondly, the colour sensing (for maze walls) didn’t seem to work properly. Standing on the train station platform one morning, I found myself revisiting, and pondering this question. It occurred to me that I actually knew someone in the programming industry who might actually be able to provide an answer in terms I could understand. As I hopped on the train, my friend replied to my Twitter message, kindly pointing out that “IF/THEN branches did NOT need to be in any kind of loop in order to work”. After reviewing his suggested reading links on the Scratch wiki, it became apparent that I had a serious gap in my understanding of the underlying logic and structures of the Scratch visual programming language. For all my research and experimentation with Scratch over the years, I’d missed something that should have been blindingly obvious. 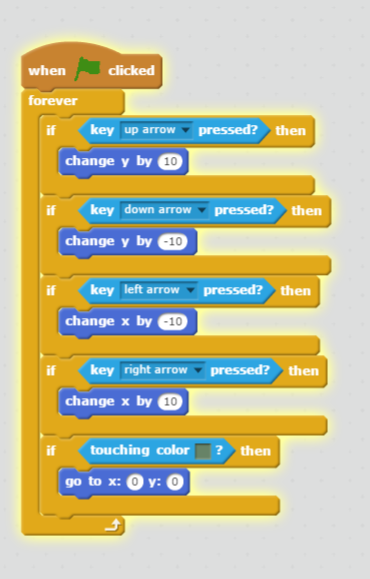 Scratch reflects the logic and syntax of a formal, event-based programming languages, and includes events, and structures such as branching (IF/THEN conditionals) and repeat loops. To my chagrin, I’d been seriously muddling up my teaching of events and IF/THEN branching. Meeting up with my friend for coffee a few days later, I began what was to become a whirlwind professional learning experience. We spent hours talking through programming concepts, examining and evaluating example Scratch projects, and discussing the best way to introduce and develop students’ visual programming skills at different year levels. The conversations continued via Twitter for weeks, and I’m just starting to feel like I can comprehend and apply what I’ve learned. Formal languages are designed so that applications written in those languages can run on devices such as desktop and laptop computers, tablets and smartphones. Each formal language has its own syntax (similar to a natural language’s grammar), which include set programming structures and rules which define how the computer reads and executes tasks. A computer is a machine, which only understands your typed code if you use the exact words, logical structures (e.g. IF this condition is met, THEN do this), and punctuation that conform to the syntax of that language. Scratch is a formal language that is presented visually rather than as text, though text can be used in some of its structures. In terms of Scratch, an event could be a key press, a mouse movement/click, or the broadcast/receipt of a message. Whenever an event is triggered, it activates a script, a programmed sequence of actions. For example, whenever the right arrow key is pressed, the sprite will move 10 steps along the x axis (to the right). Branching (IF/THEN conditionals) are used for a different purpose. They change the sequence of the script or instructions depending on whether a condition is TRUE/FALSE. Branching is especially useful for sensing walls, monsters, traps, and other sprites in Scratch game design. While the original solution involving a forever loop does work, it is not considered to be good practice because of the demands that it can place on the device. 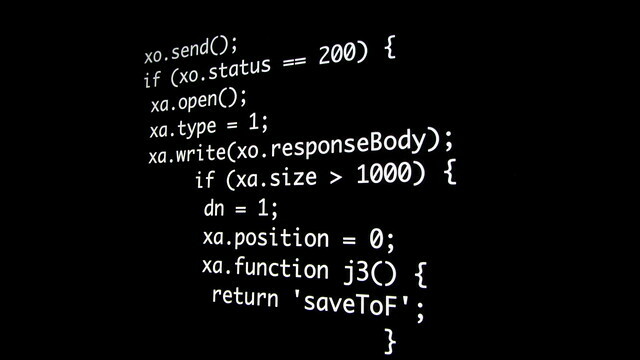 While it isn’t the end of the world that my young students have been using a forever loop as a container for IF/THEN branching to control user input via the arrow keys, it is important that they understand the logic, structures, and recommended techniques of the language they are working with – especially if they choose to explore other formal languages, such as Java and/or Python, in their secondary schooling. There is no one right way to write a program, so we need to try and teach our students to create code which is logical, structured, easy to implement, and which addresses the user’s needs. So this is a simple example of the recommended programming technique for controlling a sprite with your arrow keys, with colour sensing branching. Secondly, it has become really obvious that in order to teach visual programming effectively, I need to develop my understanding of the logic and syntax structures of the programming languages I work with. While it isn’t necessarily a pre-requisite for introducing and experimenting with Scratch, it really, seriously pays to understand the concepts that students are exposed to as they tinker, problem solve, and create digital solutions with code. Developing my professional knowledge and expertise with Scratch has taken me years, and I still find myself filling in the gaps – including the ones I didn’t know I had! One of my professional growth goals this year was to develop my understanding of how to effectively teach, assess, and support my students’ learning in visual programming, with a view to eventually exploring formal written programming languages. Ironically, I wasn’t expecting to have to go back to the very beginning, and start from Scratch! I recently applied to join a new Catholic Education WA design thinking accelerator program, known as Studio Curious. Considering that there were nearly 300 applications from across Western Australia, I was shocked and delighted to be accepted into this exciting program.As part of my application, I was asked to reflect on what makes me curious, and what innovation means to me. I’d like to take a moment to share a few excerpts from my application here. As a lifelong learner, my curiosity and desire to explore new ideas, take positive risks, and collaborate with global educators have transformed the way I teach, and the way I see the world. I’m a teacher, but most importantly, I’m a learner. I learn with my colleagues, both in my school community, and through my online professional learning networks. I am also learning alongside my students, sometimes teaching beyond my comfort zone, especially while teaching LEGO robotics. I am curious about online professional learning, design thinking, global collaboration, and leading pedagogical change within a school. In particular, I am curious about how we can support teachers’ acceptance and implementation of new curriculum and pedagogical initiatives; and how we can empower our students to connect, communicate, create, and collaborate with other children around the world. For me, innovation is the freedom to take productive risks in my teaching and learning. It is a mindset, a way of thinking, and above all, a way of doing. 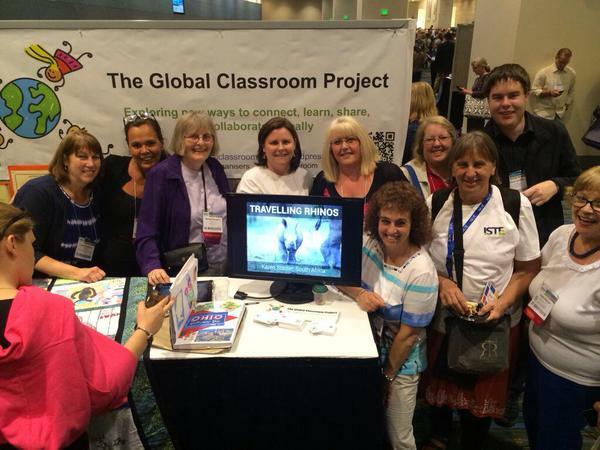 Over the years, I’ve introduced and developed several initiatives, including The Global Classroom Project, which I co-founded and led for over four years while working as a relief teacher. Now working in a school, I’m leading the development of our makerspace and robotics programs, empowering our girls’ engagement with digital technologies. Through these projects, I have learned a great deal about leading and implementing change. It is one thing to dream and come up with creative ideas, it is another thing entirely to work with others to implement, and realize the potential of those ideas. 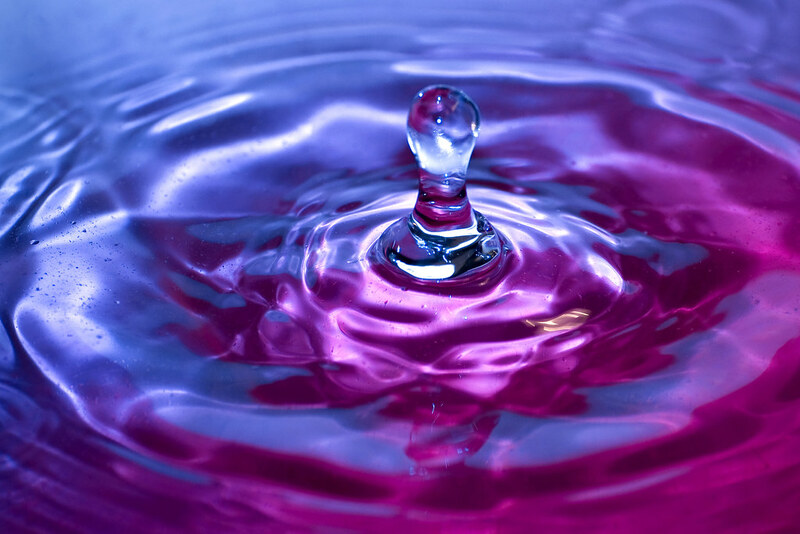 Innovation is a fluid, challenging, collaborative process of working out what works, what doesn’t, and how you can make your ideas work better within your local and global community. Innovation isn’t necessarily easy, but it can have a tremendous impact on the teachers and students involved. In my case, my innovation experiences have been life changing. So, what is Studio Curious? 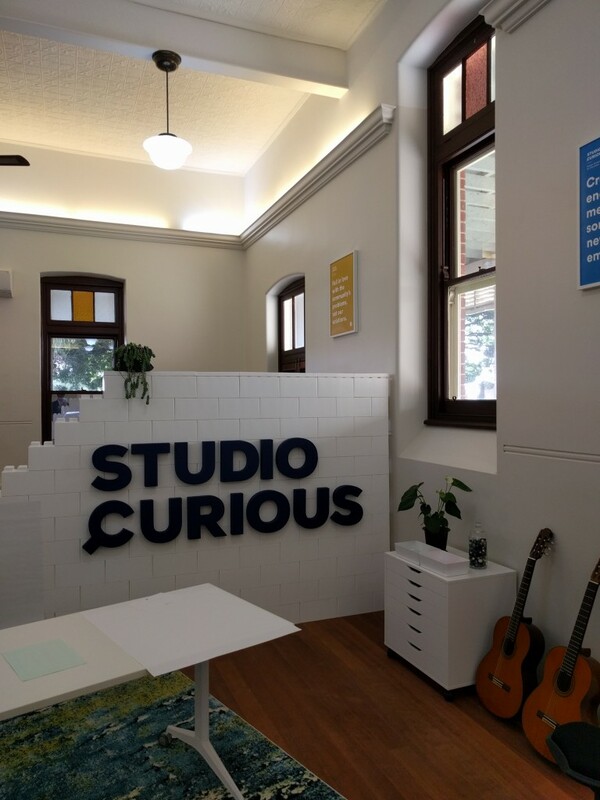 Studio Curious is an exciting experiment “designed to provide educators with the permission and confidence to create change; promote knowledge of evidence-based best practice in education; and encourage new connections”. We are a group of thinkers and change agents, coming together from all around our state to explore how we can use design thinking to empower curiosity in our education system. At this point, no one is sure where this program will lead, or what innovation projects will come out of it. I, for one, am really looking forward to finding out. After a journey of some 30 hours and over 18000km (11,603 miles), I arrived in the United States for my first ever ISTE conference. It proved to be an incredibly emotional, sometimes overwhelming week. Despite the very best advice I received in the lead up to the event, I soon discovered nothing can quite prepare you for a conference with 20 000 plus attendees, over 1000 vendors, and nearly a 1000 workshops and presentations. In trying to tell the story of my ISTE2015 journey, I’m going to focus on some key themes and experiences which stood out for me. Arriving in Philadelphia on Saturday morning with my good friend @lparisi, the weather turned nasty – and very wet. Forced to scrap my planned photo walk and city orientation, I immersed myself in the Hack Ed Unconference. Joining halfway though the day, I started meeting people I knew online, some of whom I’d been following for years; and joined group conversations about topics which interested me. I was less thrilled with the after party (I am not your typical party person), but meeting @lynnrathburn and her colleagues there made it all worthwhile. Judging by the responses to our poster sessions, and the Twitter feed for several big Ignite presentations, connecting and collaborating globally was of interest to many attendees. I thoroughly enjoyed the Global Educators Brunch, hosted by @globaledcon and @VIFLearn; and the Global Education Day event. 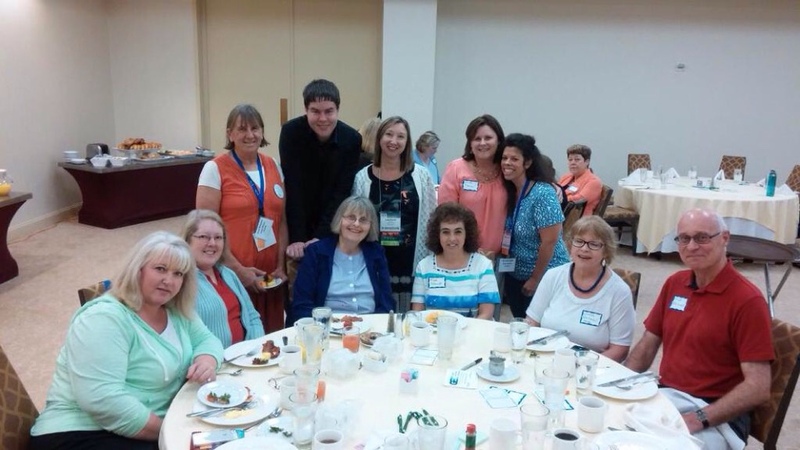 The brunch was made all the more special as it was the first time nearly all the #globalclassroom project leaders and organisers, from Australia, Canada, the United Kingdom, and all around the United States, were in the same room. Most of us were meeting for the first time after over four years of working online. The Global Education Day was interesting, but its most important aspect was the people in the room. To sit alongside and converse with global educators who have inspired, guided, and helped make me the person I am today was an amazing, and very emotional experience. I must admit this is a particularly big interest of mine at the moment, as I am trying to advise my school on the future direction of our ICT program. I am quite keen to delve into robotics and Makerspaces, and I loved the chance to explore the Maker and Coding playground events at ISTE. I played with Cubelets, shared my experiences with the MakeyMakey, searched for information on LittleBits, Squishy Circuits, and collected as much information as possible about 3D printing. I have plenty of pics, and some big ideas which I’ll be taking back to school. When I applied to present at ISTE last year, I was well aware that the organisers accept less than half of all applications. I submitted proposals for the Global Classroom Project Poster session, an iPad Creative Challenge Workshop, and joined another poster session focussed on global blogging and the Student Blogging Challenge. To my surprise, I was accepted for all three – which was unusual to say the least! The two poster sessions were incredible learning experiences, and I thoroughly enjoyed the informal, conversation based format – even though two hours proved utterly exhausting (and a little overwhelming). My workshop was a challenging experience. With just five registrations, four people turned up on the night. One left shortly after it started (I have no idea why), and one gentleman was deaf! Among the challenges was trying to run a group collaborative session with just four people, and working with American Sign Language interpreters to ensure my deaf colleague found the session valuable. I received positive informal feedback in the session, but I’ll admit it was probably the most challenging presentation I’ve ever given. Perhaps the greatest, and most emotional element of this conference was meeting Twitter friends, new and old, from all over the world. I lost count of how many hugs I received, and I won’t get started on the selfies :P. I had my first, second, and … who knows how many selfies at ISTE! While sadly not all of my #globalclassroom PLN could attend ISTE, I was deeply indebted to those who made the trek, especially those two dear friends who drove 25 hours (each way) to come and see me. I hope I was able to make that incredible roadtrip worthwhile for you. To @MrsSchmidtB4 and family, thank you for your warm hospitality. I still can’t quite believe that I was helping a “local” navigate Philadelphia, but I couldn’t have managed to see the city without your help :). To everyone I met, I thank you from the bottom of my heart. You made this conference one I will remember for many, many years to come. When you start a blog, you never know where the journey may lead. I blog to document my experiences, reflect on my teaching practice, and share my learning with others. It has helped me grow as a person, and as an educator. I’d like to think it has helped others. Through my blog, I found my voice. My voice, my story is important to me – and I will not be silenced. Thank you to everyone who has supported, contributed to, and guided me on this journey of mine. Collaborating with the CEO ICT team to complete the technical set up Google Apps for Education, and planning for staff professional development and student use in 2015. Revising the school’s Strategic Plan, ICT Policy and Internet Access Agreements, with an explicit emphasis on modelling positive digital citizenship, publishing student work online, and promoting global connections and perspectives. Researching and negotiating the Policy Framework for the development of classroom blogging across the school in 2015, and advising Admin on the advantages, disadvantages, and costs of various blogging platforms. Planning for the creation of a small-scale Student Digital Leaders program from early 2015. I consider myself fortunate to have a supportive, open-minded Administration, who are extremely keen to build our school’s digital presence into the future. I am extremely mindful of the fact that I am helping to collaboratively shape the future direction and practices of a school community, and endeavour to provide clear, explicit feedback and research-based recommendations to guide decision making and practices – with the long-term goal of bringing about sustainable, lasting change. Helping negotiate ICT plans and policies has been a challenging learning experience, and 2015 will likely be a very busy and interesting year as I will be working alongside my colleagues to help translate these ideas into their classroom practice. Implementing change may not be easy, but it certainly won’t be boring! It has been somewhat remiss of me, but having so much to do over the past few months, I am only now sharing the slides and recording from my presentation at the #OZeLive Conference, which was held some months ago. It’s good to be back to blogging, and there are a few more posts in the pipeline. My thanks to the OZeLive coordinators for an amazing conference, and the opportunity to share my story. The YouTube recording of the presentation is embedded in the slides; however, if you wish to watch the Blackboard Collaborate version, please click here. I am delighted to be involved with the brand new OzELive online conference, presented by the Australia e-Series and The Learning Revolution Project. The conference will run on February 22-23, with presentations held in Blackboard Collaborate virtual classrooms. The 45 minute sessions will be recorded and converted to MP4 format, then made available in our OZeLive You Tube channel. More details, and schedule, to follow. Follow @ozelivecon and the #ozelive hashtag on Twitter, and join the Facebook group here. The official website is here – http://australianeducators.ning.com/. It is hard to believe that a wonderful year has come to an end. My thinking, pedagogy, and attitude towards teaching has continued to evolve, and I suspect the full implications of the events and connections of 2013 will only become apparent in the years to come. Its time to reflect on the defining moments of 2013, a year of exploration, learning, and new opportunities … a year where I “spread my wings”. Much to the horror and disbelief of some, I’m a relief / casual teacher by choice … It has taken me nearly 5 years to feel like I’m starting to master this very challenging role, yet I’ve already outlasted many of my graduate teacher colleagues. I’ve learnt my lessons through the “school of hard knocks” (literally and physically), and I’m a better teacher, and a better person for it. 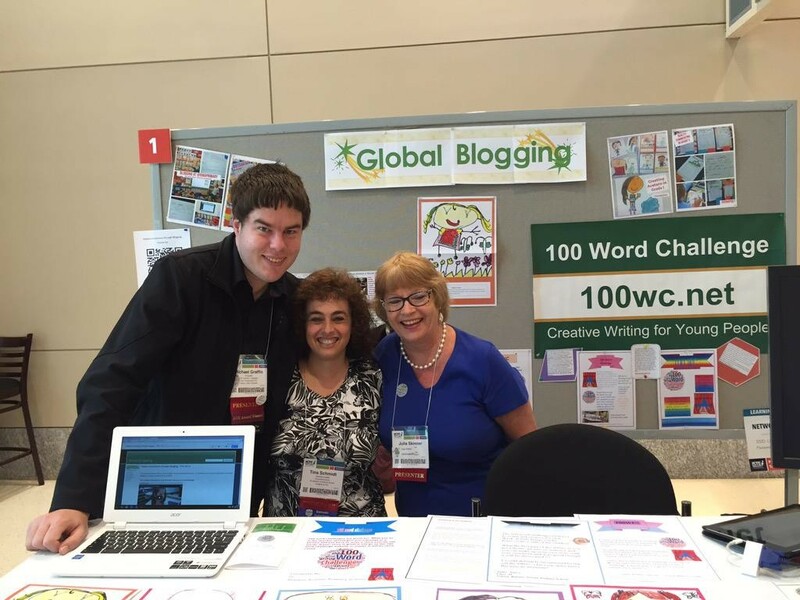 I’m so much more than “just a relief teacher” … I’m a presenter, writer, learner, and emerging global education leader … with the true privilege of growing together with an amazing group of online educators around the world. While I only worked in the #WLPSict role for a few weeks, the experience enabled me to prove to myself (my harshest critic) that I had what it took to be a competent, innovative ICT Integration teacher. It was only a taste of a role I’d like to explore further, but it gave me the freedom to experiment and learn in a supportive collegial environment. Despite never returning (a painful story), this was a fantastic learning opportunity, one which I look forward to repeating elsewhere in future. Mrs Warner, my high school English teacher, once remarked that teaching was an unusual choice of profession for someone with terrible public speaking skills, but I suspect she’d be very proud of me now. In 2013, I gave over 9 presentations, including my first keynotes (for the CONSTAWA Dinner & iEARN Social Media Panel), first international workshop, and first presentation at a local school development day. 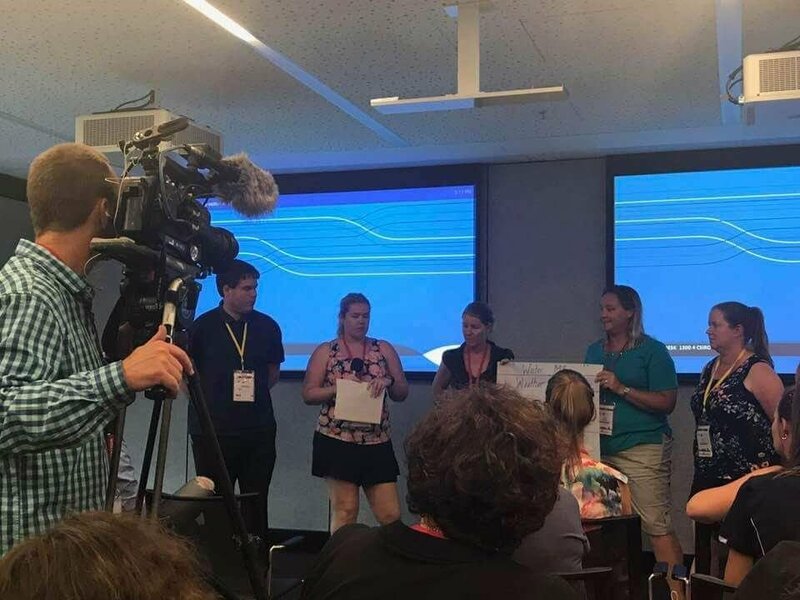 It was also the year where I returned to where it all began, at the Reform Symposium eConference, and the year I had the opportunity to co-present a workshop with Kerry Muste, one of our Global Classroom Lead Teachers. Building on my work with The Global Classroom Project, I contributed my thoughts, stories, and expertise to a wide range of magazine articles and research publications this year, and with another article due for submission in early February, 2014 looks set to be a busy year. This was the year of my first international trip (and plane flight) in over 20 years. Landing in the dusty, hot Doha airport at 5AM local time was the culmination of much planning, and deeply appreciated encouragement from iEARN Australia, an organisation I am proud to be a part of. As those who followed my #RoadtoDoha posts and photos at the time already know, Qatar was an ideal destination for a first time solo traveler, and a photographer’s dream. 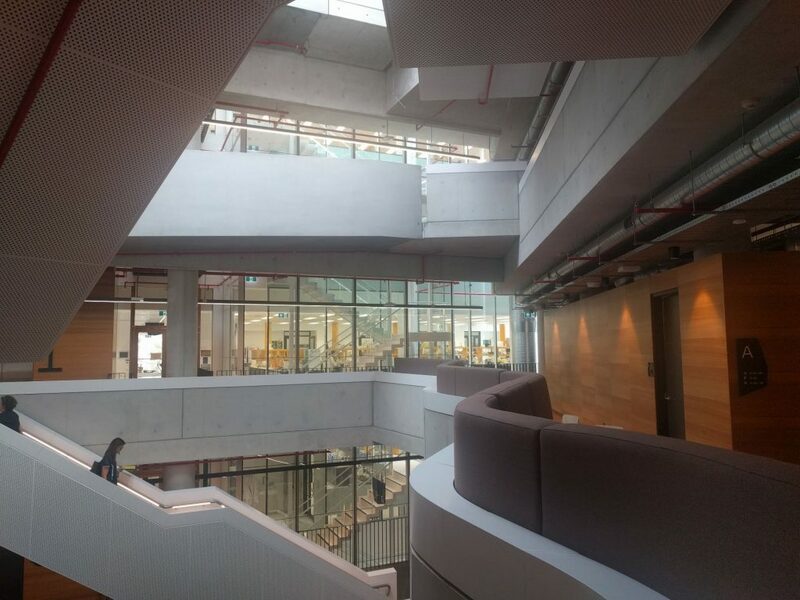 I still get slightly emotional thinking about my time in Doha, for it was a truly life changing experience – both for me as a person, and as an educator sharing my story on the world stage. So, where to from here? 2014 promises to be an interesting year. The experiences, learning, and new friendships of 2013 have helped me glimpse a potential future beyond relief teaching, and I am starting to consider how to implement some exciting new ideas. I’m in no particular hurry, because 2014 marks my return to postgraduate study, as I begin my Post Graduate Certificate in Religious Education at a local university, with a view to starting my Masters in 2015. In other news, I’m planning to travel to Sydney for the Flat Connections Conference in June 2014, and am looking forward to spending 2 weeks in what I have heard is an amazing city. I am also hoping to attend the ACEC Conference in Adelaide, but am still weighing up the details and costs of that one. I don’t know what 2014 holds for me, but I’m looking forward to finding out … One step at a time. What the heck is a PLN?